Many books exist on enlightenment yet none have been able to translate its experience in terms most can understand or relate to. After all—what is enlightenment? How does it feel? How does it happen? What changes? What are the benefits? How does one cope with its radical changes in cognition? In Awaken author Jin Nua describes his personal journey of enlightenment in the most intimate and tangible means possible. A beautiful adventure beginning in Yellowstone National Park and ending in Thailand where Jin experienced a profound spiritual transformation in which his vision sharpened, his creativity exploded, and his mind was figuratively ‘set free’. Describing his transformation as the “holy grail of human experience –the universe’s greatest gift”; Jin outlines his journey and the methods readers might use to attain higher planes of being. Not only Jin provides a host of practical advice and anecdotes on how to uplift and enhance one’s life. This treasure is jam packed with hosts of golden nuggets to elevate one’s life to the enchanted—if not the divine. Presented in a drive by, easy to follow, billboard like format; readers are sure to learn great insights and possibly even jump into their own awakening experience. 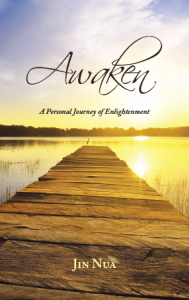 Check out this delightful VDO Book Trailer of Awaken! You can purchase a copy at jinnua.com to begin your journey. Also check out the following Awaken Book Review.